Marilyn Covarrubias said there are still a lot of things she doesn’t understand about why her son Daniel died in an encounter with Lakewood police officers in 2015. Like why the officers mistook his cell phone for a gun, why they didn’t seek medical help sooner after the shooting, and why they acted so quickly. “They need to learn how to ascertain what is actually happening. Before they go into ‘kill’ mode,” Covarrubias said. Covarrubias campaigned for Initiative 940, which was sponsored by the group De-Escalate Washington. But she said she’s happy with the compromise bill that brought some law enforcement groups onboard as well. It requires new training for law enforcement officers, makes it easier to prosecute officers for negligent shootings, and mandates independent investigations of shootings by police. 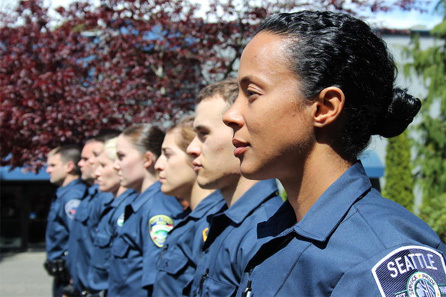 The Seattle Police Officers Guild called Initiative 940 “anti-cop,” saying it would make it easier to prosecute police for political reasons. But Sue Rahr, executive director of the state’s Criminal Justice Training Commission, said the public and law enforcement turned out to have many issues in common. Rahr said they have almost two years to implement new trainings under the law, but she hopes to get them up and running sooner. Another factor in the law would be Tim Eyman’s lawsuit. He wants a judge to put the initiative and the compromise language on the November ballot. Rahr said she’s also responsible for assembling stakeholders to weigh in on the new law. And for figuring out how to conduct independent investigations when someone dies at the hands of law enforcement. “That’s going to be an area where we’re going to have to do a lot of groundwork and create something that doesn’t currently exist,” she said, adding that the interagency team used in Snohomish County is one well-regarded model. The new law changes the threshold for prosecuting officers for negligent deaths. Critics said the old standard, which required a showing of “malice” by the officer, made prosecution nearly impossible. Now the standard will be whether the officer acted as any “reasonable” officer would have. Rahr says that’s already the standard they use in their police training. Law enforcement groups did not support Initiative 940 as proposed by De-Escalate Washington, but many did support the final compromise. James McMahan, the policy director for WA Association of Sheriffs and Police Chiefs, said the negotiations resulted in real dialogue. “We started something new where both sides of an emotional and polarizing issue began to truly listen to each other. And we want to build on that,” he said. The law emphasizes the need for police officers to provide first aid to shooting victims, as soon as the scene is secure. Rahr said Eyman’s lawsuit has not affected plans to implement the law so far. However, a hearing in the case has been scheduled for April 20 in Thurston County.